Picture this. Your instructor’s selling his school for $50,000 and has cash-ready buyers. You’re his black belt student and manager and you want to buy it but you’re a 19-year-old women, you have no money and eight banks turned you down for a loan. None of that stopped Aurora, Colorado’s courageous Victoria Wagner, the proud new owner of Kicks Martial Arts. Kicks Martial Arts is similar to many martial arts schools in Aurora, Colorado except for one thing– its owner, Victoria Wagner. Victoria is a young woman still in her late teens who brazenly found a way to buy the martial arts school where she had been training for the past several years. Wagner began training at the school when she was just 7 years old. She soon started teaching and when the owner put the school for sale, she knew she wanted it. There were many challenges along the way. The owner had several cash buyers lined up. Wagner was not one of them. She applied for small-business loans through eight different lending sources, but was denied each time. Still, she was determined to buy the school. With little funds available, Wagner approached the owner with a different technique. She presented a thorough case for why she was absolutely the best and only candidate to own the school. Her argument was convincing. The seller agreed to a deal with a strict stipulation. Wagner needed to provide an immediate $5,000 down payment and another $5,000 within one month. She borrowed $4,000 from relatives and combined that with $1,000 of her own money to secure the sale. To raise the next $5,000, due within one month, she held a giant sale at the school! This type of sale, she explains, is only held once a year and only for one hour. Everything is on sale at varying discounts, from punching bags and equipment to ornaments, mugs, t-shirts and even discounted membership-program options. The sale exceeded Wagner’s expectations. It raised a whopping $12,000! She used $5,000 of the proceeds to secure the second half (and final portion) of the down payment. The seller then offered her what she refers to as “a goodwill gesture showing that he wanted me to succeed.” He agreed to finance the balance of $40,000 with no interest. She sends him a check every month for payment. 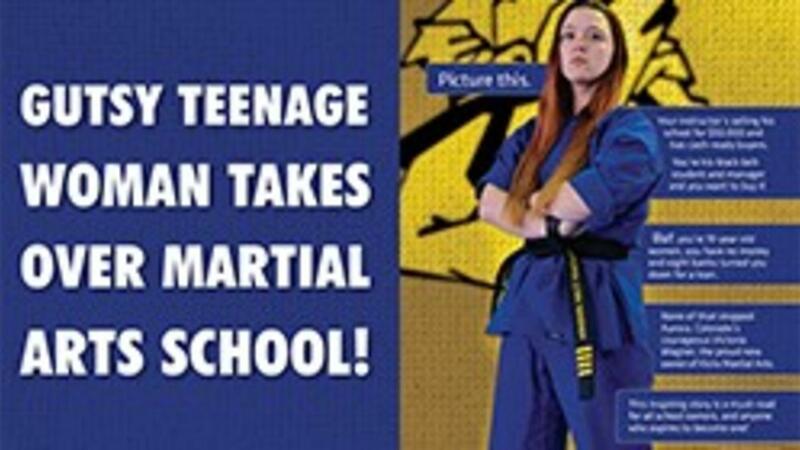 In October 2016, Victoria Wagner, just 19 but rich in enthusiasm and motivation, became a professional martial arts school owner. Subsequently, she took no salary, but used some of the school’s profit to pay for her full-time enrollment in college. After the takeover, Wagner faced many challenges like balancing time at the school with her college workload and acquiring new students. Her biggest pitfall was her age. Wagner faced discrimination because she was so young. She combated the age discrimination by hiring several staff who are older than she is and/or have more experience in the industry. She’s willing to hire students as young as 14 because, chances are, they will stay for a long time and, eventually, become seasoned instructors by the time they graduate high school. Parents will already know them, and that creates a confidence factor in the instructors and the school. Wagner has proven that the disadvantages of age can be overcome and lead to school-owner success. It is, she believes, mindset, perseverance and a willingness to follow your own passion that matters the most — not just age. Having been a martial artist since a young child, she knew instantly what she needed to do when the opportunity presented itself. Although she had a few ups and downs in the initial phases of ownership, she pushed through. She still must combat age and gender discrimination on occasion, but that doesn’t deter her at this stage. You can clearly see the pride she has in owning the studio.